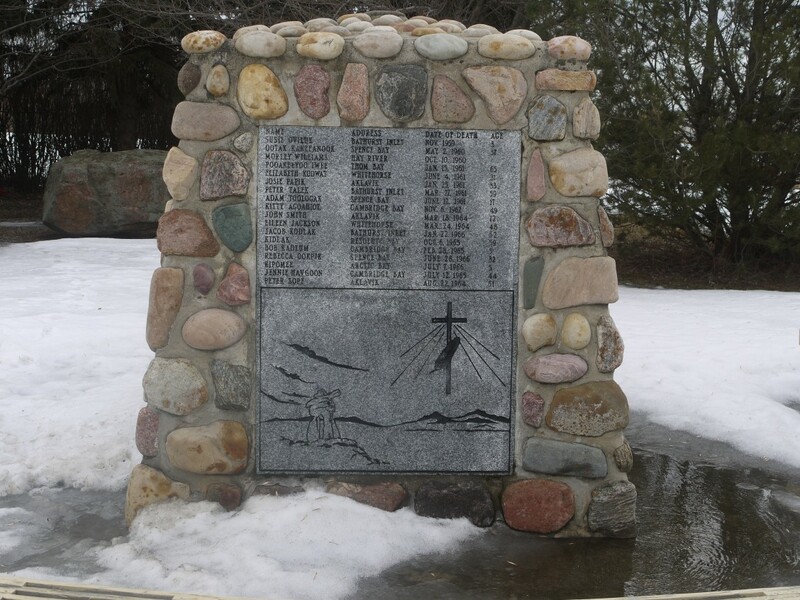 This cairn was erected in 1990 in the St. Albert Municipal Cemetery to commemorate the 98 indigenous patients from the Charles Camsell Indian Hospital who were buried here between 1946 and 1966. I certainly didn’t expect to have everything tie up neatly at the end the project, but it is sad and frustrating not to be able to deliver answers quickly to the people who contact me. When Ghosts of Camsell went live in late March, I had no idea what to expect. I was definitely nervous at how it would be received on all sides, and particularly how I would be received writing about the Indian Hospital period as a non-indigenous person. But this was a personal reconciliation project that I wanted to take on, and I was absolutely haunted by the site and the stories connected to it, so I went ahead and began posting on the blog daily for three weeks. I don’t think I ever imagined that it would resonate with so many people, not just in Edmonton but as far away as Australia and Israel and Ecuador. The number of daily views jumped from a handful in the first day to almost two thousand by early April. I received comments on posts and emails from individuals across Canada’s North as well, many of them still struggling to find loved ones who had been sent to the Camsell between 1946 and 1966. They asked if I could post the list of 98 names from the cairn erected in St. Albert Cemetery in 1990. Many asked if I had come across any information about their grandfathers, mothers, aunts, cousins, or other family members. This woman, her daughters, and her now 72-year-old mother are coming to Edmonton in late June and would like to find his gravesite so they can get some closure. Unfortunately, he is not listed on the cairn, and, as I discovered during my research, it only listed Protestant patients buried on the former grounds of the Edmonton Residential School, which was run by the United Church at the time. I certainly didn’t expect to have everything tie up neatly at the end the project, but it is sad and frustrating not to be able to deliver answers quickly to the people who contact me. Through the power of the internet and social media, though, I am tracking down leads for where Joseph and other Catholic patients may have been buried and plan on checking out the Beechmont and Winterburn cemeteries this summer. As I wait for funding to continue this work, I am also keeping track of all the possible locations for records that might give a clue to the identities of patients and what happened to them. I am also connecting with Edmontonians of various backgrounds to hear their stories about the Camsell. It is certainly a complex, layered place in terms of its history. I love what one of my indigenous colleagues, Miranda Jimmy, said about it – that it’s a place in the city where mainstream and Aboriginal histories really intersect. But, like so many similar sites of this nature, the narratives have often run parallel with very few points of true intersection. This was illustrated so clearly for me at the Stanley Milner Library on the evening of May 19, 2015. I partnered with David Rauch of Open Edmonton and Edmonton In Your Own Words) to hold a Camsell memories recording session in the Maker Space sound booths. Again, I had a hard time imagining exactly who would come out or what they might say. It turned out to be the perfect sample – what I would say is a typical cross-section of people’s experiences of the hospital. There was a long-time, non-native nurse who had very fond memories of her decades there working with the different patients. There were the non-native patients who had lovely experiences of bringing children into the world in the maternity ward or being treated there. And there was the man who had, as a young ‘urban explorer’, scaled the fence and gleefully broken into the abandoned building on several occasions. It’s hard for people to reconcile these different experiences of the same place, but that’s exactly what I hope to do with my research around the Charles Camsell Hospital. Work toward real reconciliation for the future through an understanding of our shared pasts.